Before yesterday, this was as close as Riley got to her hero. 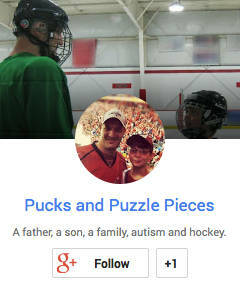 I talk a lot on the blog about how hockey is the glue that holds our little family together. I have been passionate about the sport literally since the first time I saw it as a four-year old. I have been a fan and a player ever since, and I now enjoy a rewarding career in the industry surrounding the sport. But far more important is the common bond the sport provides, especially with a son on the autism spectrum. The fact that we all love the sport provides more opportunities for togetherness than any other activity. That bond might not exist except for Riley. Roughly eight years ago, when she was three, I took the entire family to a Devils game. Ryan was bored, and disconnected. Riley? She was hooked. She loved the speed, the crowd noise, the celebrations and yes, even the fights. 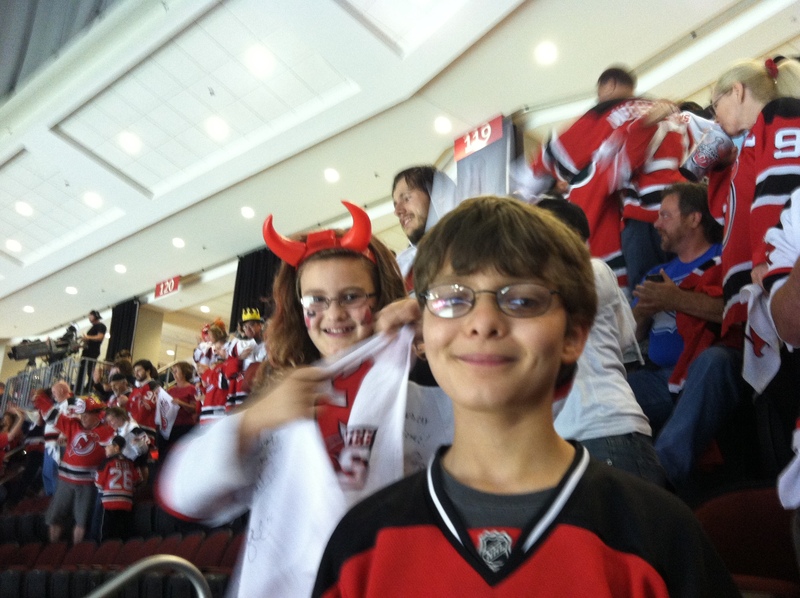 But most especially, she loved the Devils goalie, Martin Brodeur. Seeing an in with my daughter, I sought to teach her all about Brodeur, who had already won three Stanley Cups by then, and was on his way to owning every major career goaltending record. Riley made up her mind. 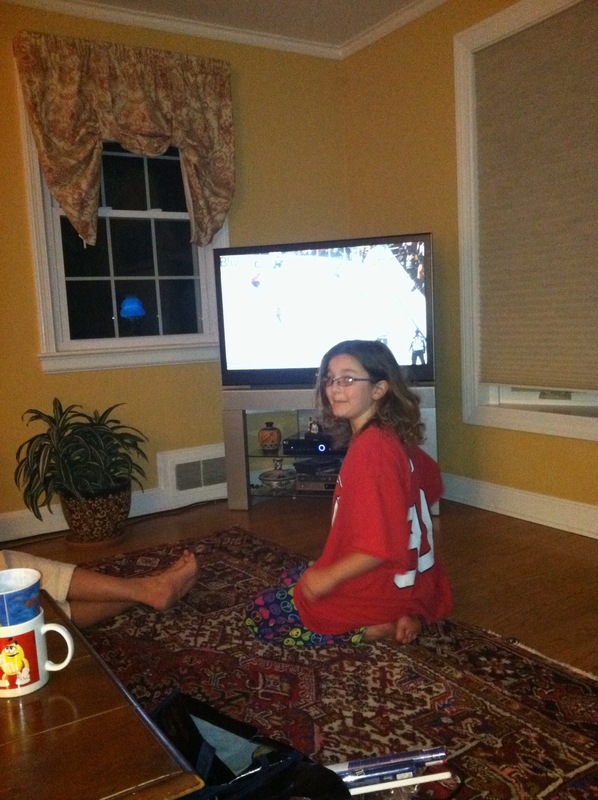 Hockey would be her sport, the Devils would be her team, and Brodeur would be her favorite player. She failed to understand how I could be a fan of any other team. “WE LIVE IN NEW JERSEY!” she would protest any time the subject was raised. After Game 6 against the Rangers. All along, she never wavered in her devotion to the team or its goaltender. Her room had one poster of Taylor Swift — and TWO of Brodeur. She slept in his jersey t-shirt. She got a #30 jersey with his name on the back. When she started playing soccer, she decided to be a goalie, and demanded to wear #30. When we became season-ticket holders a few years ago, there was one thing she was more excited about than any other: season-ticket holders get invited to a meet-and-greet event with the players. Riley had met NHL players before, and had collected several autographs on another of her jerseys. 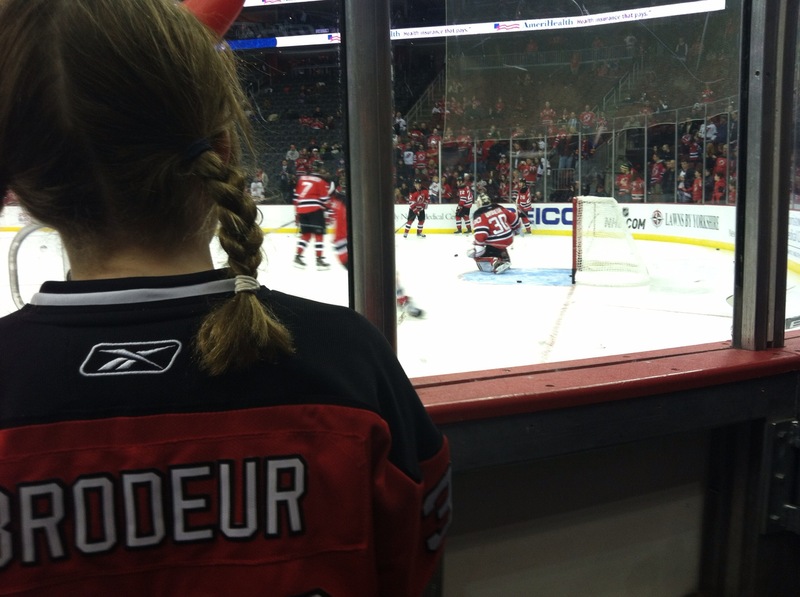 But there was only one Devil she wanted to meet: her hero and idol, Martin Brodeur. Watching Brodeur and the Devils in a late-night playoff game. Well, our first meet-and-greet was scuttled by the NHL work stoppage last season. This year’s event was on, but Brodeur’s father passed away just a few days before and he was quite understandably absent. Riley put on a brave face and collected photos with many of the other players, but she was growing worried. Brodeur is in the last year of his contract. He’s 41. He’s losing playing time to the Devils’ new goalie, Cory Schneider. It was a race against time — would she get a chance to meet him before he retired, or moved on? He lives very close to us, as do many of the Devils. Veronica even ran into him in the grocery store one day. Riley staked out his favorite pizza place a time or two, but no Marty. Finally, an opportunity. A nearby restaurant was hosting an Oktoberfest fund-raiser, with several former Devils slated to appear. But the real attraction was a promised appearance by Brodeur. Veronica investigated. She called the restaurant and asked if children were permitted (no certainty at an Oktoberfest, but we were in luck). She sought an assurance that Brodeur would appear and that Riley would get a chance to meet him. Reasonably certain, she bought tickets for the two of them. The event was yesterday. There was just one problem. Veronica came up sick, felled by a nasty head cold. Riley agreed to have me as a stand in. With Riley at the Oktoberfest event. No Marty … yet. I was worried — this was a lot of pressure. 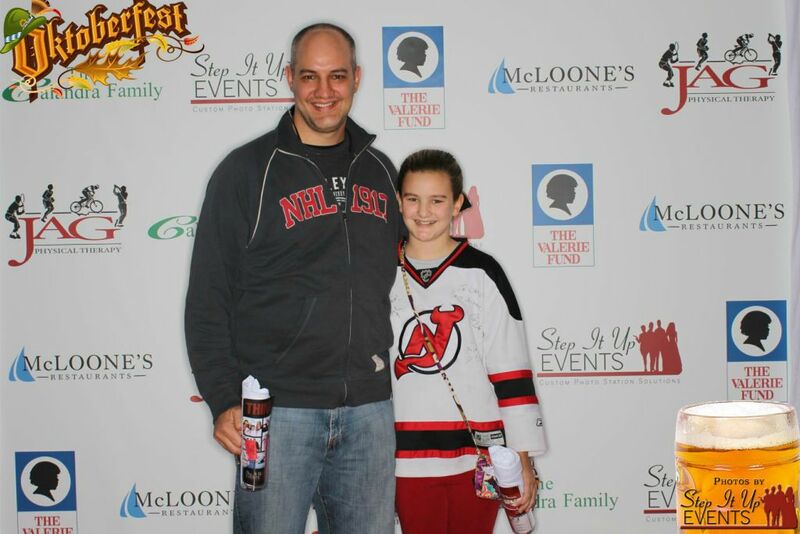 I’m sure my daughter was not the only attendee intent on meeting Brodeur at the event. We got there just after it started and immediately started gathering intelligence. We spied a former Devils player, Bruce Driver, and approached for an autograph. He actually plays in my men’s league sometimes, so I struck up a conversation. He was incredibly pleasant, as has been the case with almost every hockey player I’ve ever met. He gave us our first key bit of info — Marty was due in about an hour. Riley and I got some food and settled in a spot that we thought would give us first view of Brodeur when he arrived. A little more than an hour passed and Riley was getting nervous. She went to take a scouting trip around the restaurant. Suddenly, she was back at my side, shaken. “Dad, dad, he’s HERE!” she whisper/shouted (so as not to alert everyone around us). Her look was part excitement, part terror. She was trembling. “Let’s go!” I told her. We went inside and spied him by the door. A line was quickly forming for pictures but because Riley had spotted him so quickly we were right near the front. Not more than two or three minutes passed before she had shaken his hand, posed for a picture, and gotten his autograph right on the crest of her jersey. FINALLY! 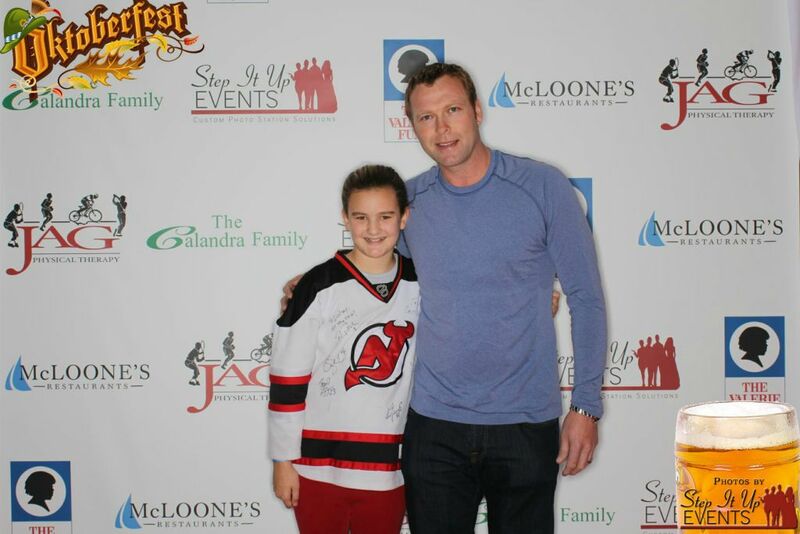 Riley meets her idol, Martin Brodeur. I congratulated her on meeting her idol. She was still excited, but relieved. Still, as the thrill faded, she started thinking of all the things she wanted to tell him. About how she chose him as her favorite player at age 3. About the posters. The #30 soccer jersey. How their birthdays were one day apart. Brodeur stuck around to auction off some items and then was just milling around the restaurant, casually talking to fans, even waiting in line to get something to drink. I made sure Riley saw that. Here was her hero, acting like any other patron. He walked right past us, but Riley froze. After, she was determined to try again, and asked me to help. We saw Marty standing, talking to some fans. We moved closer and waited for our turn. I introduced myself, told him I worked in hockey and that I wanted him to meet one of his biggest fans. Riley began to rattle off everything she wanted to tell him, and he listened patiently and thanked her several times. He even joked with her about how she makes fun of her Ranger-fan friends. I was so proud of her. She was at once, terrified, excited, nervous and incredibly charming. And Broduer? He could not have been nicer. The conversation lasted only a couple of minutes, but it meant the world to her. He was kind and paid attention to her. He wasn’t the least bit distracted. I thanked him for his time and we were off. Riley was floating. This had been everything she hoped for, and more. As I watched her, I saw so much of myself at her age. Hockey players were my idols, too, and I would have done anything to have a similar experience. We tend to fall into the pattern of mother-daughter and father-son outings. I was sorry that Veronica missed this opportunity, because I wanted her to see the look on Riley’s face when she met Brodeur. But I was glad how it worked out. It brought things full circle. At the beginning of our family’s hockey adventure, it was the two of us. Riley brought Ryan and Veronica along by the sheer force of her will. And because of that we have experienced some truly amazing things. You know what else I loved? Ryan, who has always been more interested in hockey players’ stats than the players themselves, was jealous. He wants to know she he’s going to meet Joe Thornton and the rest of the Sharks. He has his sister to thank. This is SO cool! What an awesome experience for her! I became a hockey fan when I met my husband (native to NJ) and he always said hockey players were the nicest of the athletes. That has certainly been my experience. To see Marty waiting on line for a drink really summed it up. I’m sure there were dozens of people there who would have gotten it for him, but he just acted the same as everyone else.